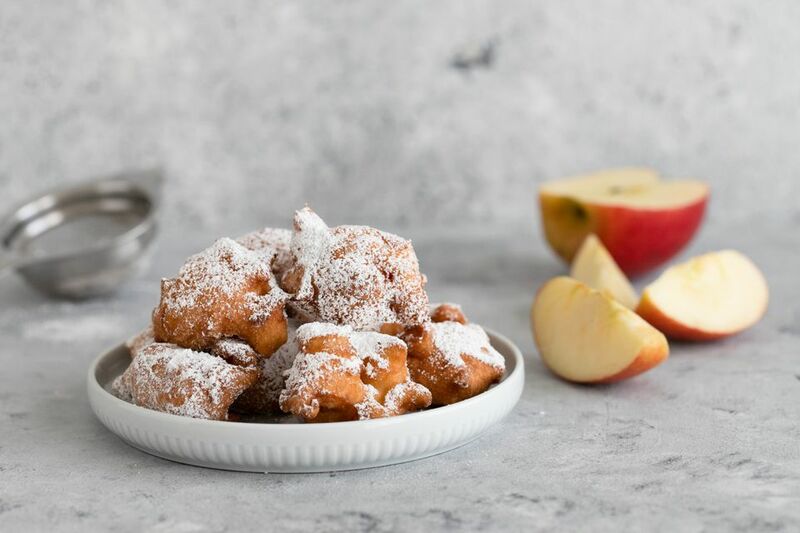 These delicious apple fritters make an excellent breakfast or dessert dish. Heat the warming drawer or oven to 200F to keep the fritters warm as you fry batches. Heat about 2 1/2 to 3 inches of oil in a deep saucepan or in the deep fryer to about 360 F to 370 F.
Sift together the flour, sugar, salt, and baking powder. Add milk and egg and beat until batter is smooth. Drop by teaspoonfuls into deep hot oil and fry for about 2 to 3 minutes, until the fritters are golden brown. Drain well on paper towels. Keep warm while making subsequent batches. Roll in confectioners' sugar or cinnamon sugar for serving, or serve warm, with syrup.